The complete results of April 2016 professional and sub-professional level exams of the Civil Service - Paper and Pencil Test (CSE-PPT) also known as Career service examination were released by the Civil Service Commission (CSC) on May 26, 2016. 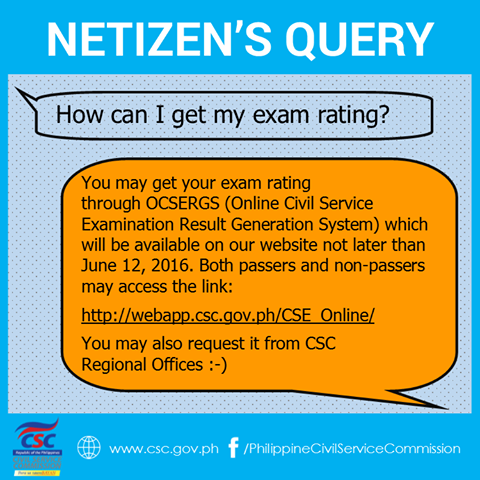 Takers of CSE-PPT (passers and non-passers) may now check the examination rating report online. The CSC said that individual test result generation through OCSERGS (Online Civil Service Examination Result Generation System) shall be available not later than June 12, 2016. June 10 UPDATE: CSC apologized for the system error of Online CS Examination Results Generation System (OCSERGS) and said that the full data bank of examinees' ratings shall be available on June 12. In case of problem on results generation, you may also request copy of exam ratings through regional offices. "All concerns on examination results, including verification of Examinee Number, should be coordinated directly with the CSC Regional Office (CSCRO) concerned. A complete directory of the CSCROs can be accessed in the CSC website www.csc.gov.ph," CSC said. The Certification of Eligibility (CoE) for passers (printed on CSC letterhead, free of charge) shall be available, through the CSC Regional Offices upon printing, but not later than June 29, 2016. Passers may also opt to apply for regular Certification of Eligibility (printed on security paper at cost). The next schedule of the Career Service Written Examinations is October 23, 2016. Filing for application will remain open until September 1, 2016. Applicants should personally file their applications at the CSCRO, or at the CSCRO’s Field Offices where they intend to take the examination.